Closure Alert: The Hite Cove trail is currently closed due to damage from the 2018 Ferguson Fire. According to the official forest order (PDF), it will be closed until December of 2020, though sources at the forest service have told me that it might reopen by March of 2020. Why hike the Hite Cove Trail? It's one of the area's great wildflower-spotting hikes, and one of the earliest starters - you can see dozens of flower varieties here while Yosemite's high meadows are still under several feet of snow. You'll also get to see the union of the south and central forks of the Merced River, which meet at the trailhead and then journey together, by and large amiably, to the Pacific. Like ravens and black widows, rivers mate for life. 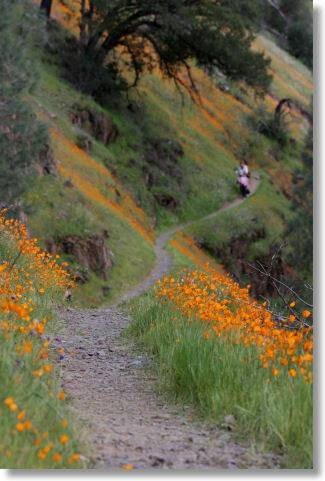 Crowd Factor: It can be popular during the wildflower display, but since there's no particularly magnetic destination, the other hikers will be spread out throughout the canyon and the trail won't feel crowded. Scenery Factor: The Hite Cove trail is all about the wildflowers, which grow in profusion throughout the first two miles of the trail. Hite Cove itself is an abandoned mining settlement some 4.5 miles (7.2 km) down the trail. The Hite Cove trail rolls through the narrow canyon of the south fork of the Merced River. It starts well above the canyon floor, but descends to the river after roughly a mile and a half (2.5 km). At these sub-2,000-foot elevations, the ground cover runs to oak, brush, and Digger pines, rather than the stately conifers common throughout Yosemite. (1) Once the trail's descended to river level, around two miles into the hike, continue another few hundred meters along the river until you encounter a pair of rock shelves, about fifty meters apart, jutting out into the water. The shelves are covered with intricate carved furrows in patterns akin to a contour map, but better because they don't have elevation readings, so there's no risk of going crosseyed following a contour line to the place where it actually has a listed elevation (typically on another map altogether). Plus it's a contour map you can jump up and down on, wantonly destroying its one-thirtieth scale civilization and crushing the tiny inhabitants for failing to worship you properly!1 It's also a pleasant place for you to sit and watch the river - which, come to think of it, might be an even more terrifying revenge. (2) This option is shorter and provides a good hike capper if you're liking later in the season when Live Forever and Blazing Star are both blooming (typically late April or early May). A bit under a mile along, the trail descends steeply and briefly as it routes through a section of exposed rock. There will usually be lots of Live Forever growing out of the cliffside in picturesque ways here, and just on the other side is a colony of Blazing Star. (Usually. Wildflowers aren't wholly reliable.) You're not likely to see many new flower species after this point. (3) Wherever you feel like it. Difficulty: Moderate. There's not much total elevation gain, but there are lots of rolling ups and downs along the trail. The first hundred meters or so, including the climb from the highway to the trailhead, is arguably the hardest stretch. Best Time to Visit: March through mid-May, depending on how severe the winter's been. By the end of May, the grass and flowers are dying and it's getting much too hot anyway. Nearest Bathrooms & Snacks: At the Cedar Lodge, 3 miles (4.8 km) east of the trailhead. There's also a portable toilet across the road from the trailhead. Driving Directions: The Hite Cove trailhead is on highway 140, 8.5 miles (13.5 km) west of Yosemite's El Portal border (10.5 miles west of the ticket gate, which is a couple miles inside the park) and 21 miles (33 km) east of Mariposa. It's at the site of the historic Savage's Trading Post. The buildings here no longer serve as a trading post, but the Savage's sign is still easy to spot. The trailhead is just east of the landslide that closed the road for months in the spring of 2006. There's now a one-lane detour that crosses the river to bypass the slide, which is a work in progress and, particularly after storms, tends to wake up and roll over a few times before going back into snooze mode. The stoplight to access the detour has a cycle of something over five minutes, so you can save time by interpreting the traffic laws liberally if you see the light turning yellow as you arrive. You'll only run into the detour, by the way, if you drive to Hite Cove from Mariposa; if you're arriving from Yosemite Valley, you'll miss it altogether and reading this paragraph was, unfortunately, a complete waste of time. The first 0.75 miles (1.2 km) of the trail are over private property. Parking: Along highway 140 across the road from the trailhead. Hazards: The first mile and a half (2.4 km) of the trail winds along the hillside about a hundred feet above the river. For the most part, slipping off the trail would lead to some memorable and instructive bruises, but nothing worse. There are spots, however, where the dropoff is sheer enough that a fall could kill you. Be careful when stepping aside to let other hikers pass (it's a single-track trail) and save the wine until after the hike. You'll find lots of poison oak here, a few mosquitoes, and the occasional tick. Later in the year (when you shouldn't be here anyway) you may encounter rattlesnakes. 1 It turns out you can do this with regular contour maps, too, if you set them on the ground first. And it's just as satisfying.